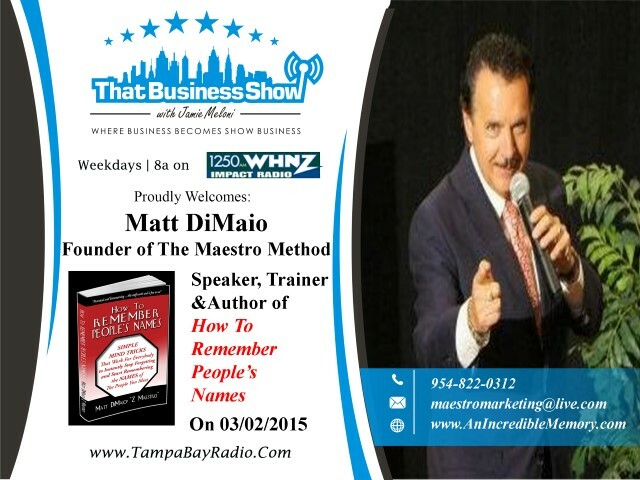 Today on That Business Show I spoke with the very entertaining Matt DiMaio, author of the book How To Remember People’s Names and Founder of the Maestro Method, a learning technique to help you become smarter, better and faster and retaining information. Matt DiMaio tells some great stories on this show including one of how he overcame the obstacle of being a young presented to an aged and experienced audience as well as shares some techniques on how he and you are able to retain more information. We touched on the importance of using these techniques in business and I closed out with a story of my early days as an amateur open mic stand up comedian. Matt DiMaio is available for speaking and mentoring and offers all radio show listeners a free online memory/learning analysis. Just visit his website at http://www.anincrediblememory.com or reach out to him via email at maestromarketing@live.com or phone at 954-822-0312.